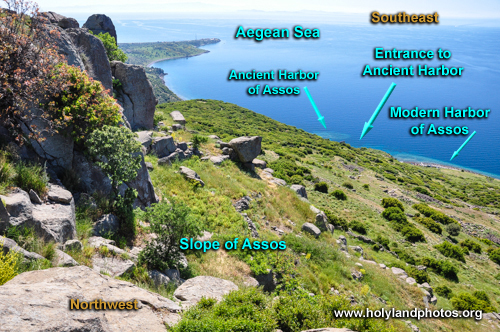 View looking down from the acropolis of Assos to the east with the Aegean Sea in the upper right portion of the image. 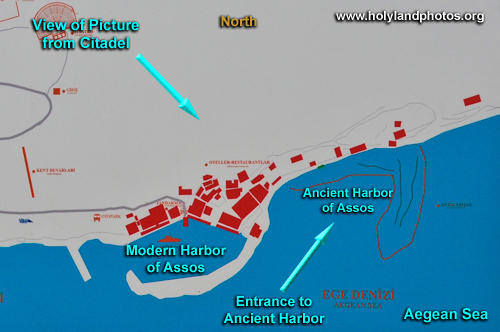 In the far right the "modern" harbor of Assos is visible and about in the center of the image the outline of the ancient harbor is visible in the blue water. It would have been from this harbor that Paul's party would have set sail for Mitylene, Kios, and eventually Miletus (Acts 20:15).